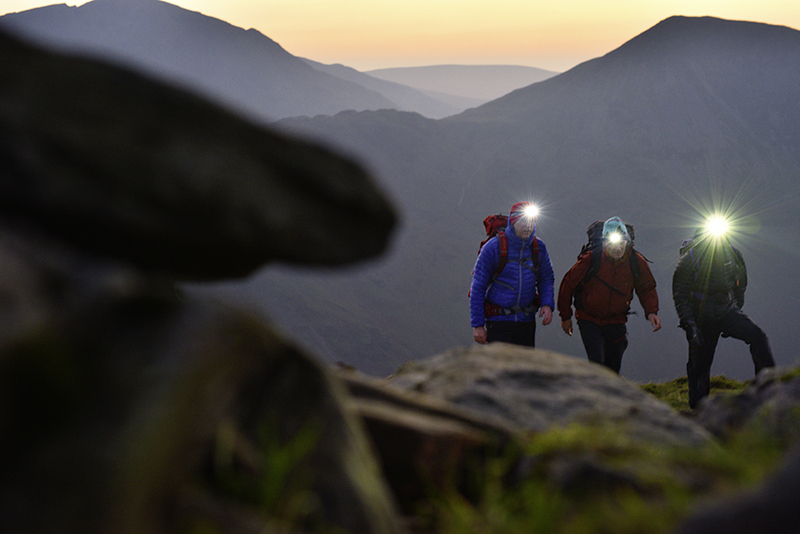 There’s no need to stop hillwalking when the sun goes down – but you do need the right headtorch, so we’ve taken a closer look at six of the best from across the price and performance range. GP’s Explor PHR15 offers all the power you need for most walking situations, and at a great price. The automatic distance sensor is brilliant for reducing power use, as the torch simply turns up the power when you look into the distance. The PHR15 uses 3x rechargeable batteries (recharged via the onboard USB socket) but will also accept AAA alkalines. The single-button operation is easy to use, allowing you to switch between power settings and turn the auto sensing option on or off. One slight niggle is that you can’t lock-off the operation button to prevent accidentally turning it on when it’s in your rucksack. Battery life is also a little shorter than others here, and the times GP quotes are for alkaline batteries (5-69 hours), with rechargeables providing a lesser 3-42 hours. The Intensity 230 is great for the environment and your bank balance – as it’s well priced and uses a USB rechargeable built-in battery unit that is charged via a port on the side. A power indicator light lets you know how much juice is in the tank. I found the 70 lumens power setting was just enough light to get me off the hill, while saving the 230 lumens boost for short sections on trickier ground. The torch has a single-button operation, which is easy to use even with gloves on. The downside is if you are heading into the wilds for a few days without access to a means of recharging then you cannot slip in a spare battery of any form if the juice runs out. Also a 100-150 lumens setting would have been more useful when walking and prevented the need to use the 230 lumens, which burns battery life. This has everything you need and more, with one floodlight and one spot, both with four power settings and easily operated via glove-friendly buttons. You can’t turn the buttons on accidentally either, as when the lamp is tipped up to its highest position the buttons are covered, but when tilted slightly in normal use they are exposed. The huge power output is provided by a rechargeable battery pack at the back of the head. It is recharged by a micro USB plug but you can fit CR123A batteries, although these are not as readily available as standard AAA or AAs. This headtorch offers more power than required for general walking, and others are lighter or lower in price, but for hard users this is a stunning option if you need extra durability and power. Does the combination of a low price and a high power outweigh any design drawbacks for this headtorch? As always with Alpkit, the price is stunning for what you get, as it’s both well built and well featured. The three main power settings of high, medium and low are managed by a single button with a very positive click, which is easy to find with the fingers too. Power comes from a built-in rechargeable battery, with a USB port tucked away behind the battery pack at the back of the head. The battery can be removed easily and replaced as needed, so you could carry a spare if required (NB: The warranty would be voided if you do this, but Alpkit has told us it is looking into it). The focus control is a nice touch, with a simple aluminium ring for adjusting the beam from floodlight to spot, which can even be operated with gloved hands. Compared to others around this price you get a far more solidly constructed headtorch with longer burn times, and IP64 rating means it is splash-resistant. Some higher priced torches offer more, such as higher waterproofness ratings so they can be submerged for longer periods. This is also a heavier torch, so the battery pack is placed at the back of the head for more comfort. Although both the power and burn times are great for hillwalking and camping, you can get even more power and burn time if you pay a little more. Annoyingly, but like many others, there’s no ability to lock the operation button to ensure the headtorch doesn’t turn on accidentally in your rucksack. The other main drawback is that you cannot fit readily available AA or AAA batteries, and as mentioned above there is a warranty issue with taking a spare rechargeable. But if you suspect you won’t have access to some means of recharging the battery you may have to take a spare, fully-charged lithium-ion rechargeable with you. Surprisingly there is no low power indicator either. Superb value for money, with great power output for hillwalkers, but it is heavier and more bulky to carry and lacks some benefits of higher priced torches. This lightweight headtorch is not the most powerful, but does it provide all the features most hillwalkers will actually require? This has all you really need for hillwalking, with a reasonable 100 lumens for seven hours, which is great for general night walking, and you can boost that to 350 lumens for short bursts to find the route. So long as you switch back to a lower power settings you can get reasonable burn times. This is also lighter and more compact than higher powered torches, so you don’t mind carrying it in your rucksack even if it is rarely used. It’s operated with just one button, which makes it easy to turn on and switch through the functions. You even get a red light to manage night vision better. The option of either 3x AAA batteries or a rechargeable battery gives a choice of power, and there is a USB socket so you can recharge the battery without removing it from the torch. But you can also take it out for charging, as the USB socket is built into the battery itself rather than the torch. Burn times are lower than some other torches around this price, but that is due to having 3x rather than 4x AAA batteries, and the result in part is less weight and bulk on your head. You have to ask the question: do you really need a torch this light when if you add a few grams you can get longer burn times or more power? But to me this torch has all you need in general – why carry more? The bigger drawbacks are that there is no means of locking off the operation button, apart from removing the battery, so if you accidentally turn this on when it is sitting in a rucksack you may lose power. Rated as IPX4, it can resist a spray of water – but others are higher rated and can survive being submerged. Great for most hillwalkers, as it is light, compact and has a good power source and output, but some others offer more power, longer burn times and more water resistance. With more power and features than last year, is this the best option for hillwalkers... or can you have too much of a good thing? This popular headtorch has new features for 2019, with power rising from 350 to 375 lumens and a massive quoted burn time of 75 hours. It’s also rated waterproof to IP67, which means it can be submerged to 1m for up to 30 minutes, so Black Diamond is right to brag that the Storm is engineered for epics. The white LED light is fully adjustable for brightness from 8 lumens right up to 375, so you can choose exactly how much light you want, and the long burn time means you shouldn’t have to worry about running out of juice. If you value red, blue and green light, then you have those on board too. The unique PowerTap feature means you can tap the casing for a short boost at full power, which is useful on complex ground, while the lock function ensures the Storm can’t get turned on accidentally, which is superb and one of the many features that set this headtorch apart. For something as simple as a headtorch the Storm isn’t quick to get to know, and I struggled to work out how to use it during our outing on Fleetwith Pike. Even after a few more days of use I still get lost within its functions. Operation is complex, with three different buttons, and I found the power tap boost kicked in when I grabbed the casing to adjust the tilt angle. For normal hillwalking, 375 lumens seemed excessive, as only 100 lumens is really needed to safely navigate at night, and the main beam is so bright and distant on full power that it cut out all of my peripheral vision. You don’t get the option to recharge the batteries directly, so you either need to take spare alkalines or get an additional recharging kit for the batteries. As it takes 4x AAAs rather than the 3x used on other torches it has a longer burn time, but this also adds extra weight and bulk. Great light output and burn time for hillwalkers and camping, but you need to consider if the extra features are worth the time spent working out how to use them.